‘Eye in the Sky’ is the latest Hollywood film dealing with the wars of the American Empire. This one however, is a bit different. Other than the usual military glorification that we have seen in films like “American Sniper” or “Zero Dark Thirty”, the film actually does challenge the audience to deal with the real underlying moral problems of modern warfare. The way the so called west fights wars these days is highly problematic. In the past, war meant that you had to send soldiers to the battlefield, where they were in real danger to die or at least get seriously injured. The advance of weapon technology has changed this more and more. The further advanced the technology became, the further away from his target the soldiers had to be. We are now at the point where, via computers and satellites, a weapon can be fired remotely from everywhere on the planet. As a consequence, bravery is no longer a real requirement to be part of the military. You can be a complete coward and still become an excellent soldier. A military personal can effectively engage in very destructive fighting operations without any personal risk to himself. Working as a construction worker is probably a lot more dangerous than engaging in a lot of battles these days. This lower body count is not necessarily something to celebrate. It has made war much more acceptable for the general public, to the degree that a lot of people are not even really aware that countries like the US have been at almost constant war, at least since WWII. We got a good indication of how unaware people are of this fact after the attacks on the World Trade Centre in New York on September 11th 2001. Most people were clearly confused that someone had attacked the US. Why did they do this? Here was this peace loving land of the free, suddenly under attack by some wild savages for no other reason than completely irrational hatred of the western lifestyle. I of course agree that these attacks were horrible and completely unjustifiable. But they did not happen in a vacuum. They happened in the context of a war that the US and her allies were fighting for a long time and that they arguably started. Yes, absolutely, 9/11 was an unjustifiable massacre of innocent people. But so is a lot of what western militaries do. Because the other side of this modern weapons technology is that in order to save the lives of western soldiers, more people have to die on the other side of the battle field. And that means, mostly more innocent people. 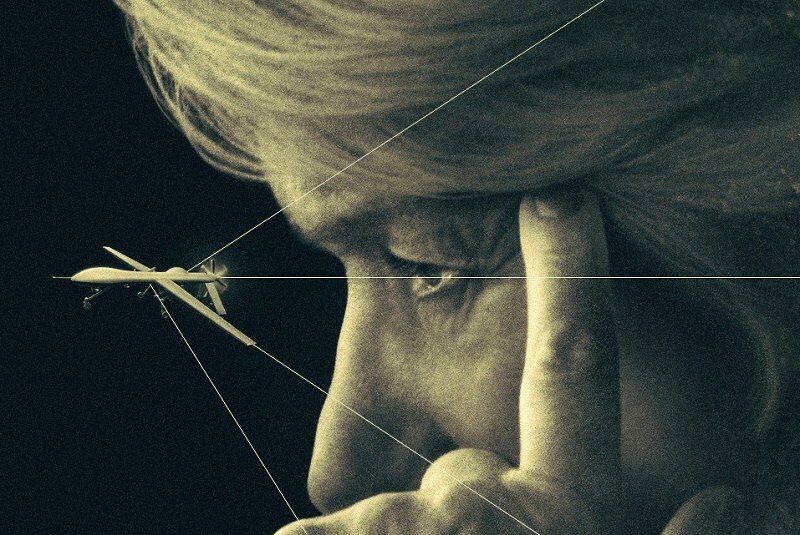 This is one of the moral problems that ‘Eye In The Sky’ deals with. If you haven’t seen it, spoiler alert, I might mention some detail of what is happening in the film. Although it does not matter too much, as even if you know the plot, it is still an excellent film to watch. I can very much recommend it. The film deals with a few problem, but the main and most important moral problem that is addressed is this: The military of the US and the UK in a joined mission have spotted a few wanted members of the Al Shabaab terror group in a house in Nairobi, Kenya. Via an electronic beetle they fly a small camera into the house. Watching what is going on, they realise that there are two people in there who are preparing for an imminent suicide mission. However, they could stop the suicide bombers by blowing up the house via a drone in the Sky (hence the name ‘Eye in the Sky’). The problem is that the house is bordering on a square with a number of people. Most importantly there is a young girl selling bread right next to the house. Bombing the house would very likely kill the girl, especially since the explosion would be amplified by the explosives in the house. So the question is, is it morally ok to kill the girl (and some other people), if that prevents the likely deaths of even more people from the suicide bombers. Probably quite realistically, the people in charge of the US military are portrait as being a bit confused by the notion that this situation poses a moral problem that needs answering. Probably a bit less realistic is that the English side is very concerned about this moral problem. This is arguable the weak point of this film, but it is needed otherwise the problem would not be discussed, which is what the film, to its great credit, really wants to do. In other words, the main problem of the film is the acceptability of what today is euphemistically called ‘collateral damage’. Is it ok, to kill innocent people, even children, to achieve some higher goal? The film ultimately does not answer this questions. But it does show a good summery of the arguments for the yes and no camp. From a libertarian point of view, the answer is of course clear. It is of course not ok to kill innocent people for a greater goal. Which greater goal would that be? There is no greater goal than the life and liberty of the individual human beings. However, the question is asked in a more clever way that might get some people to become confused about what the right thing to do would be. The problem is that the greater goal in this situation is to save the lives of even more other people. So the question that is ask is, can you kill one innocent person in order to same more other innocent people. But the answer to that question also clearly needs to be no as well. Lives do not add up in some magical life pool. Every individual person counts on their own. And every person is only responsible for their own actions. In other words, it not only matters who gets killed, but also who kills. Is it me who does the killing or someone else. I can only be responsible for my own actions, not that of others. This is particularly true if it comes to deciding who gets killed. Yes, in the situation portrait in the film, the terrorists would likely go on and kill some people. But they would not have killed that girl. So the person who bombs the house and kills the girl essentially takes on the role of a judge over who gets to die and who to live. Where does the authority come from to make such a decision? A person, who thinks he has that authority cannot claim he was not responsible for what happened. He becomes a murderer. People who argue otherwise, need to make the argument, that lives do indeed add up. They would need to make the argument, that human lives are exchangeable. It does not matter who dies, all that matters is the body count. In this mindset, humans are just numbers and not individuals. However, this is exactly the mindset of every totalitarian greater good regime. That means we are going down the rabbit whole of totalitarianism. But I do not believe that most people really do believe this. The test for it is simple. What if the girl is not just anonymous, but your own daughter or at least someone you know? Or what if it is your own life that is at stake? I bet it becomes immediately difficult to just see these people as the a number 1 in a bigger equation. If that is true, then what is really behind the argument is just primitive tribalism. It is only the lives of my own kind that matter. Strangers however, are numbers that can be add up in simple equations. That really is the moral standard of people arguing in favour of murdering innocent people for a greater good. And we really have to overcome this standard if we want to live in a better, freer world.